Obituary for Michael J Iavagnilio | Hartzler-Gutermuth-Inman Funeral Home Inc.
Michael J. Iavagnilio, 90, of Elkhart, Indiana passed away peacefully on Friday, April 12, 2019 at Elkhart Hospice House surrounded by family. Mike was born in Elkhart, IN on December 7, 1928 to John and Genevieve (Swartz) Iavagnilio. He married Janet Bleiler on August 21, 1954. He is survived by Janet, his wife of 64 years, his 8 children; Deb (Jim) Bowers, Cindy Iavagnilio, Michele Iavagnilio, Pam (Glen) Lambright, Michael (Sandy) Iavagnilio, Nancy Iavagnilio, John (Lisa) Iavagnilio, Rico (Maryann) Iavagnilio, special family friend Theresa Helms, 19 grandchildren, and 6 great grandchildren. 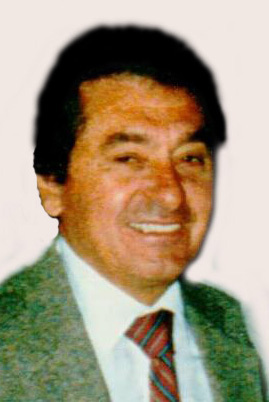 He was preceded in death by his parents, his brother Frank “Nooch” Iavagnilo, and a great granddaughter. As a child, Mike attended St. Vincent De Paul Catholic School where he served as an altar boy. He graduated from Elkhart High in 1947 and was a member of the track team as a pole vaulter. Mike went to college for 2 years before he enlisted in the Army. He served during the Korean War from 1951 to 1953 and was stationed to Germany. Mike was a quiet and compassionate man that enjoyed serving others. He and his wife Janet owned Michael’s Italian Restaurant. Under their spirit of hospitality, the business has flourished for 60 years. He was beloved by many in the Elkhart community. His passion for golf was known far and wide. Any spare time was spent at the golf course. He was a member of the Elk’s Lodge #425 and Christiana Creek Country Club for over 50 years. Some of his fondest memories lie between the 1st and 18th holes. Mike was a kind, committed and loving husband, father, and grandfather. He was a man of faith and good moral character. He will be greatly missed. Visitation for Mike will be held on Sunday, April 14th from 3:00pm until 7:00 pm at the Hartzler-Gutermuth-Inman Funeral Home and also on Monday, April 15th from 10:00 am until the hour of the service at 11:00, all at St. Vincent DePaul Catholic Church. The Rev. Patrick Hake of St. Vincent DePaul will officiate. Burial will be in St. Vincent Catholic Cemetery where military honors will be rendered. Memorial contributions in memory of Mike may be made to St. Vincent DePaul Catholic Church 1108 S. Main St. Elkhart, IN 46516. Special thank to the staff at Greenleaf Health Campus, Elkhart General Hospital, and Hospice House. Your kindness and care were greatly appreciated.